LITTLEROCK – Four people, including a 2-year-old girl, were injured Wednesday in a three-vehicle crash that happened during the pursuit of a reckless driving suspect. The crash occurred about 1:45 p.m. Wednesday, Oct. 10, at the intersection of 95th Street East and Avenue R, according to a California Highway Patrol report. The chase began after a CHP officer traveling westbound on Palmdale Boulevard near 50th Street East spotted an eastbound BMW with paper plates that was “passing on the right shoulder and at a high rate of speed,” according to the CHP report. “[The officer] activated the code 3 lights in an attempt to slow down the driver of the BMW. The driver of the BMW accelerated as he passed the patrol vehicle’s location,” the CHP report states. The officer made a U-turn and gave chase, and the high-speed pursuit traveled through various streets in Palmdale and continued east into Littlerock, with the BMW driver running several stop signs along the way, according to the CHP report. As the pursuit continued southbound on 95th Street East, the BMW driver ran a posted stop sign at Avenue R and slammed into a 2017 Ford Mustang. The collision sent the Mustang careening into a 2013 Dodge Durango that was stopped facing northbound at the intersection, the CHP report states. 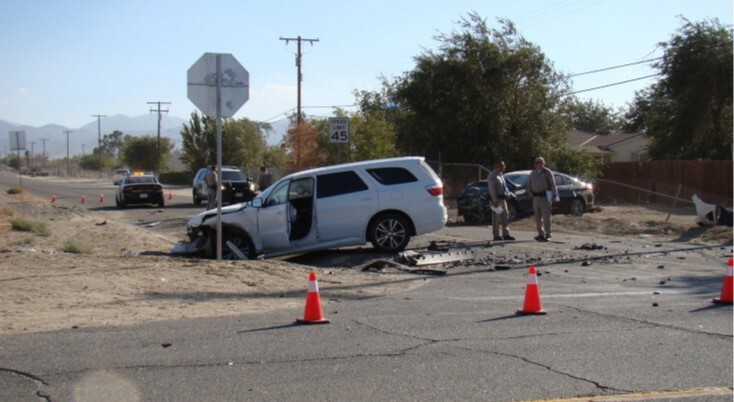 The Durango’s driver, 39-year-old Alicia Soto of Littlerock, and her passenger, a 2-year-old girl, both sustained moderate injuries and were transported to Antelope Valley Hospital for treatment. 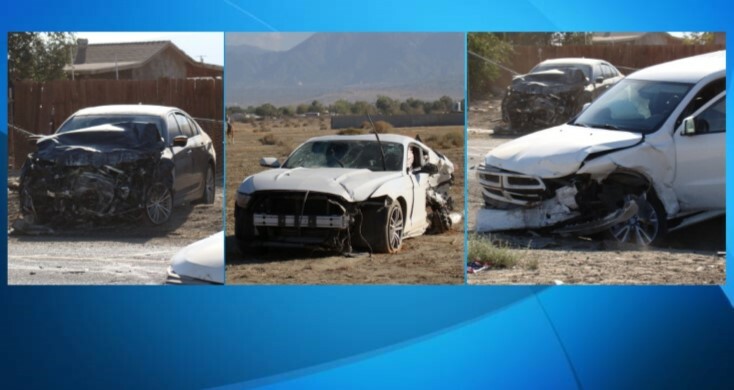 The Mustang’s driver, 18-year-old Angel Pelayo of Littlerock, also sustained moderate injuries and was transported to Antelope Valley Hospital for treatment. The BMW driver, 27-year-old Eduardo Murillo Duran of Littlerock, sustained major injuries in the crash and was transported to Antelope Valley Hospital. A 13-year-old boy who was a passenger in the BMW was not transported, CHP Officer Gil Hernandez told a news videographer at the scene. Duran will be facing multiple charges, including felony evading a peace officer, driving under the influence, child endangerment, and assault with a deadly weapon on a peace officer, according to the CHP report. At one point during the chase, Duran tried to ram a second CHP vehicle that responded to assist in the pursuit, Hernandez said. The intersection of 95th Street East and Avenue R was closed for approximately four hours on Wednesday to allow the officers to conduct their investigation. 14 comments for "Four hurt in crash at the end of chase"
God Bless the CHP, Idiots like these should not be allowed to drive!!! Go onto the streets here and its like your on a freeway!!! I’m wondering why the 13yr old wasn’t taken to get checked out at least..maybe cops tried to arrest him too..
Perhaps the medics on site checked him out. Hey Mars, Have you fallen and bumped your head? We need stiffer penalties for as holes like this! Thank goodness he didn’t kill anyone while driving like a donkey! Most importantly, thank you AV CHP for being at the right place at the right time. The CHP was not at the right place at the right time. I estimate a 99.9% chance that the suspect would have made it home with no problem had there not been a high-speed chase. And then there would have been no crash and no injuries. Many people drive while intoxicated everyday and go about their business. If the 2 year old girl had been killed would you still think the CHP is the big hero in all this? And what about the companies who make alcohol? Can they just sit on their pile of money and have no blame for anything? You’re right the CHP are no heroes, they’ll give you a ticket while you struggle to feed your kids. The people that took Ahumada are wondering if they were better off taking a blonde haired punk. To some guy…. CHP witnessed the reckless and dangerous driving and started the pursuit. Many times, IF it’s called in, they are UTL. I didn’t use the word hero. Where did you come up with that stuff? No matter the outcome, the CHP is trained well and since the [removed] refused to pull over, that means the drunk [removed driver is the one who put the 2 year old in jeopardy. Why should alcohol companies be responsible for idiots like this? I’ve figured you out though…. you don’t believe in personal responsibility. To Jayden Hernandez… shouldn’t be breaking the law if you’re struggling with kids. Thousands of people struggle with kids every damn day and responsibly choose not to break the law. We need more illegal aliens without licenses or insurance in AV. Driving isn’t dangerous enough. right let them take each other out, the all sound illegal to me. And fast Eddie will more than likely face two civil lawsuits as well. Idiots like this should have there hands tied to their ankles and thrown into a prison shower naked!